Facing increased margin pressure and competition, a $20B deep water rig manufacturer came to NorthOut to understand how digital could change the game. Starting with a user focused research sprint, NorthOut uncovered and then developed ways to drastically reduce the time to market for a new rig. On site in Texas our product and engineering team got to work. With diverse internal opinions on how digital could best impact their business, NorthOut started by holding company wide interviews, ran research sprints and talked directly to customers to uncover the highest impact opportunities. Built an Online Rig Builder. Our findings showed that building an online, 3D enabled configuration tool could reduce lead times by 75%. That mean companies like Shell could drag and drop parts, view real-time pricing impacts and submit proposals right from a tablet. Moving to a digital buying platform enabled new learning for predictive pricing, parts acquisition and beyond. This meant not only do purchases happen more efficiently, less waste and planned buying increases margin per unit sold. NorthOut brought diverse perspectives to a digitally limited world. Running user focused research sprints was a new concept for the organization’s leadership. We talked directly to customers, developed roadmaps and visualization to drive internal alignment. NorthOut walked the walk by quickly creating a proof of concept, demonstrating to customers and then expanding the build. This powered alignment while de-risking the larger initiative and limiting budget. While expectations were that any large digital project could take over a year, our combined local and offshore team built at lightspeed to meet a 3 month internal version 1 timeline. We kept grinding from there. A single oil rig generates over 100gb of data a day putting digital platforms and data analysis front and center. 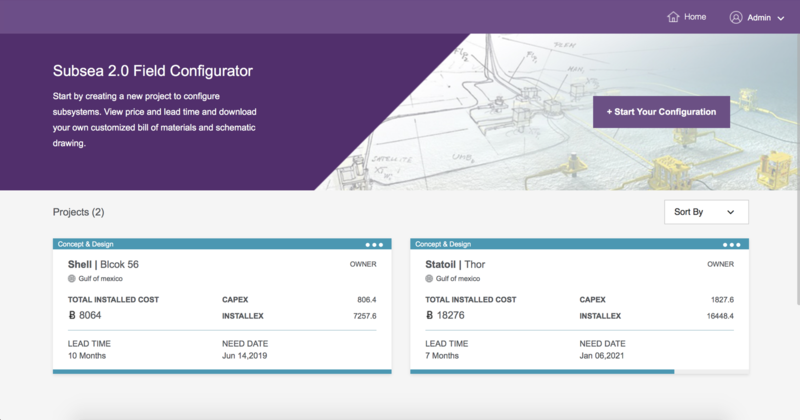 From managing and designing the subsea floor, to seeing live updates to schematics – the configurator brought an Amazon-like approach to the entire build process. While buyers loved the building tool, the real secret sauce is the dynamic creation of all required documentation and SAP integration to go from estimation to build ready almost instantly. From energy to manufacturing the next generation of leaders will embrace digital and big data to out maneuver the competition.